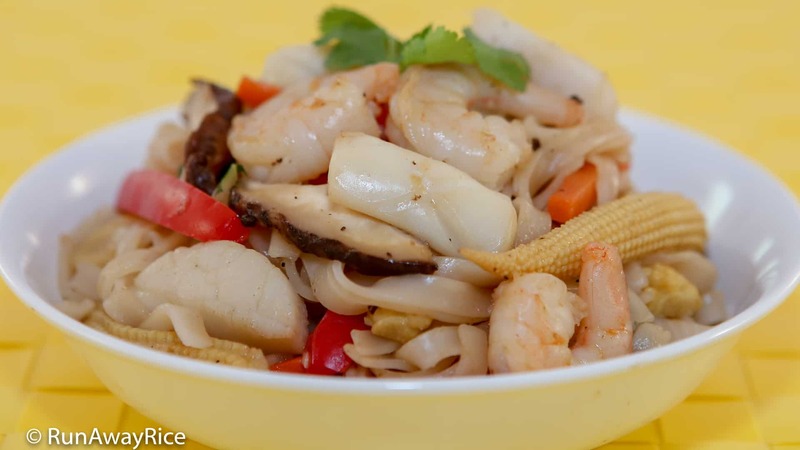 Stir-Fried Seafood Noodles (Hu Tieu Xao Do Bien) is a dish made with thick rice noodles stir-fried with abundant vegetables and tasty seafood. Every time I see this scrumptious dish on a menu I have to resist ordering it because I know it’s so much better and healthier when made at home. One of my biggest hesitations about eating out is that a lot of dishes are prepared with so much oil and then covered in a thick salty sauce. Yes, the food tastes great but then I am left with that icky that-wasn’t-so-good-for-me feeling. Cooking at home means I can control what goes into my food and nothing makes me happier than preparing and enjoying a healthy meal for my family and friends. This Stir-Fried Seafood Noodles (Hu Tieu Xao Do Bien) recipe is fairly simple to make and there’s no wrong ingredient to use. Pick the type and quantity of vegetables you enjoy. Keep in mind the key to a perfect stir fry is cutting the vegetables to approximately the same size and then cooking the vegetables in the order of their density. The trio of seafood: shrimp, scallops and squid is really delicious. Learn how to add a neat texture to the squid by scoring it with a “pineapple cut”. Don’t skip the step where we blanch the squid. This is the trick for preventing rubbery squid and makes it super tender and succulent. Fill a large bowl with hot tap water and soak the rice noodle for approximately 20 minutes. Drain in a colander and shake off the excess water. Peel and slice garlic into fine strips. Cut carrots and red bell peppers into thin strips approximately 1/4 inch thick. Separate bok choy leaves and stems. Cut the leaves into 1 inch thick strips. Cut the onion, bok choy stems and mushrooms into strips approximately 1/2 inch thick. Slice the baby corn in half lengthwise. Cut along one side of the squid body using scissors and then lay the squid flat on a cutting board. Position a knife at the lower left corner of the squid body. Using just the tip of the knife, score the squid body with diagonal lines about 1/4 inch apart. Don’t cut through the squid. We are just marking it with lines. Move to the lower right side of the squid body and repeat the same diagonal scoring. (This is known as the pineapple cut and makes a really nice pattern on the squid body.) Cut the squid body into chunks. Bring a large pot of water to a rapid boil. Blanch the squid for 20 seconds. Drain and set aside. Cut scallops so they are approximately the same size as the shrimp, first into thirds and then each section in half lengthwise. Heat a large wok over High heat. Add 1 Tbsp of vegetable oil. Add half of the sliced garlic and stir fry for 5 seconds. Add the squid and stir fry for 30 seconds. Add the scallops and shrimp. Season with black pepper. Partially cook the seafood by stir frying for just 2 minutes. Remove from wok and set aside in a small bowl. Heat the same wok over Medium high heat. Add 1 Tbsp of vegetable oil. Add the remaining garlic and stir fry for 5 seconds. Add the carrots along with 2 Tbsp of water. Stir fry for 2 minutes until the carrots start to soften. Add the onions, bok choy stems plus 1 Tbsp water and stir fry for another minute. Next add the red bell peppers and stir fry for another minute. Add the corn, bok choy leaves and mushrooms. Combine everything well, cooking for another minute. Add 1 Tbsp oyster sauce, 1 Tbsp soy sauce and and 1/4 tsp ground black pepper. Stir fry for 1 more minute. Transfer the vegetables into a separate bowl. Heat the same work over medium heat. Add the remaining 1 Tbsp of vegetable oil. Add the soaked rice noodle and stir fry for 2-3 minutes. Pour in the chicken broth. Turn the heat to Low and cook the noodles until they are soft and all the broth is absorbed, approximately 4-5 minutes. As the noodles are cooking, stir every minute to prevent them from sticking together. Add the vegetables and seafood into the wok and toss everything together. Add the remaining 2 Tbsp oyster sauce, 2 Tbsp soy sauce and 2 Tbsp fish sauce, ground black pepper and sugar. Combine everything well. Cook for another 3-4 minutes or until the shrimp is pink. Serve the Stir-Fried Seafood Noodles with a side of soy sauce and chili paste.